Dr. Richmond retired on March 31, 2019 after 30 years as pastor. 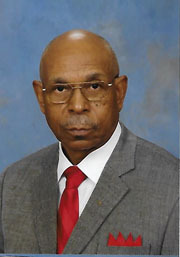 Under Dr. Richmond's leadership Shady Hill Baptist Church prospered. A few examples include, new 500 seat sanctuary, renovation of old sanctuary to 300 seat dining room and kitchen, new pews and furniture for new sanctuary, purchase of additional land for parking, added more than 150 new members, increased tithes and offering, purchased two 15 passenger vans, organized J.R. Male Chorus, and ordained 8 new deacons. This is only a small rendering of how our church prospered under Dr. Richmond's leadership. With all of his many accomplishments and involvements, Dr. Richmond still found/finds the time to minister to the needs and concerns of the members of the congregation. Dr. Richmond was born in Orange County, Cedar Grove, NC, to Walter W. and Viola Love Richmond. Graduated from Central High School in Hillsborough, NC, received a B.S. degree from NC A & T State University in Greensboro, NC, a B.A. degree from Shaw University in Raleigh, NC, M.S. and Ph.D. from North Carolina State University in Raleigh, NC. He also received Theology Certificates from Duke University, School of Divinity in Durham, NC and Institute of Biblical Studies in Lynchburg, VA.
Employment has included, Professor of Science in Theology at Apex School of Theology in Apex, NC, Adjunct Professor of Science at Shaw University in Raleigh, NC, Visiting Professor of Biology at NC A&T State University in Greensboro, NC, and NC Central University in Durham, NC. Also, employed as Adjunct Professor of Natural Resources at NC State University in Raleigh, NC, and currently as Research Scientist for USDA, Forest Service in Research Triangle Park, NC. Religious positions held include serving on the General Board of the General Baptist State Convention of NC, Inc. in Raleigh, NC, Vice President of Ministers and Deacons Union, Executive Board Chairman, Moderator from July 1994 through July 1997 of East Cedar Grove Association. Also, Licensed Minister (December 1987) with Lee's Chapel Baptist Church, Cedar Grove, NC, Ordained Minister (July 1988), East Cedar Grove Association, Creedmoor, NC. From October 1988 to the present, as Pastor of Shady Hill Missionary Baptist Church in Roxboro, NC. Dr. Richmond's past and present memberships include, Veteran of US Air Force, member of Research Triangle Science and Mathematics Partnership, Durham Ministerial Alliance, Person County Ministerial Alliance, American Legion, Entomological Society of America, Society of American Foresters, NC Biotechnology Center, project Review Team, National Science Foundation Proposal Review Panel, Who's Who in Science and Engineering, Sigma Xi Scientific Research Society, Alpha Phi Alpha Fraternity, Inc., and the NAACP. Dr. Richmond was married to Shirley Brown Richmond (Mrs. Richmond passed away in 2017), and they has four (4) children, Mesina R. Reddish, James A. (Art) Richmond, Jr., Valerie R. Williams and Monica R. Williams and many grandchildren.